Hello again! It’s Friday night and I’m debating whether or not to get up at 3.30am to watch the opening ceremony of the Olympics. It does come only once every four years, after all, and since I got a pretty sweet deal with the last one (my state being in the same timezone as Beijing) I figure I can afford to sacrifice some sleep this time around. But three thirty in the middle of winter? It’s a tough one. I don’t know if you’re planning to watch, or if you’ve been affected at all by Olympic fever, but I do know that you’re probably a Eurovision fan (if not, what are you doing here?) 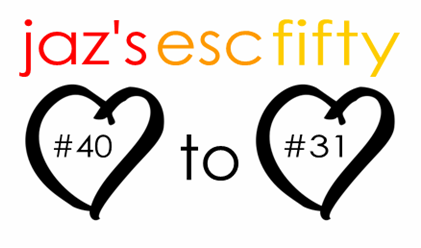 in which case you may be interested in the next installment of my contest fifty. Oh wait, there’s one more thing – please keep the feedback coming! I’ve really enjoyed reading your comments so far, even the ones that trash my beloved entries. Feel free to let me know which of the songs I’ve chosen would make your hot list, or not. This was my absolute favourite song of 2011 and is one of many Balkan entries to make the cut in my best-of. And yet, I can’t put my finger on why it’s so brilliant. It’s a toe-tapping number with a catchy chorus like so many others, but somehow it kicks a high percentage of those songs’ butts. Similarly, this song is one of countless up-tempo ethno-pop tracks, the likes of which Greece in particular have been sending to Eurovision for Rambo Amadeus’ donkey’s years. But it’s just that little bit catchier than most, and the fact that it’s a duet between the fabulous Helena Paparizou and that guy with the bouzouki works in its favour, aurally and visually. If you can hear me screaming ‘Why didn’t this qualify??? ?’ from wherever you are in the world at the moment, just ignore it; I have to pin it on the poor vocal performance. It’s the only explanation as far as I’m concerned, because the song is awesome. As were the indoor plants Kristina decided to roll in for her costume. We all know the story of the imaginary-language song that came from nowhere in Riga to blaze up the scoreboard and fall only behind Turkey, and only by 2 points – it’s a great story to accompany a great song. It’s just a shame Belgium haven’t been able to recapture the success of Sanomi, even with another made-up language entry. Then again, that one was like nails down an overly-enthusiastic, red-and-white striped blackboard. I’m going there: this is by far Portugal’s best entry EVER. Okay, not all of you will agree with me, but I was never that gone on Senhora Do Mar (the entry I’m assuming would be ranked above this one by the disagree-ers) so this really stands out for me. Everything is ethnic, but still catchy, accessible, and generally charming. This may not be my absolute favourite Polish entry (hint hint) but it’s up there, and it was both their first and most successful Eurovision outing. It’s a brilliant ballad performed by the Polish Mariah Carey (Wikipedia’s words, not mine) in a nightdress. What’s not to love? Apart from the fact that it lost to Ireland, who topped the scoreboard for the third year running with a rather dire three minutes of nostalgia, of course. One of my strongest memories of Year Oslo was attempting to use mind power to will this song into the top 10 during the voting. Obviously I failed, but after Serbia didn’t even make the final in Moscow with one of my then-favourites, I had to be happy with the fact that Milan, his Lego haircut, and his cracking Balkan entry did. So. Much. FUN! If Haunting Ballads for Dummies existed, I’m pretty sure the co-authors would be Željko Joksimović and Hayko. I love everything about this song and performance, right down to the bleeding heart (although the first time I saw it, I thought he’d been shot and had a panic attack). The combination of English and Armenian is perfect, and the music gives me chills/spine-tingles/goosebumps etc. I have four ESC-themed ringtones on my phone, and this is the one I’m using right now. Every time it goes off my head is suddenly filled with images of fake tan and hairless chests and sliding doors that can be clung to in some impossible way. Ah, such good memories. As far as the song goes, I have one word: epic. Three cheers for a message song that doesn’t make you want to vomit! Hip hip hooray x3. Back in ’82, all Nicole wanted was a little peace (why she didn’t represent Germany at Miss Universe I don’t know) but she ended up winning Eurovision instead…and later, my heart (now there’s something to make you nauseous). One of the things that really appeals to me in this song is how pretty German – which is not a particularly musical language in my opinion – sounds. And so another one bites the dust. I may or may not have an Olympic-and-ESC-themed intermission from the countdown this week, just to warn you, so if you’re repelled by anything to do with people propelling themselves metres in the air with giant poles and such (as ridiculously amazing as it is) perhaps you should stay away. To finish off, here’s a recap of my fifty so far. Posted on July 28, 2012, in Random Stuff and tagged all-time, best, Dino Merlin, Edyta Gorniak, ESC, Eurovision, favourite Eurovision songs, Koldun. Bookmark the permalink. 19 Comments. Not in Australia it isn’t! Yay! More entries! Anyway, I like the lot much more than the previous one. #40: Fifth for me in 2011, right behind Switzerland, Azerbaijan, The Netherlands and Iceland. Fantastically epic and catchy without being poppy and ridiculous. I love it. #39: Hmph. I prefer Helena’s winning entry, but this is still a good song that’s incessantly catchy, possibly to the point of annoyance. I frequently catch myself humming it. #38: This one was hot when I first stumbled onto Eurovision, so I checked it out to see what all the hype was about. For me, I thought that it was a bit overrated, a decent song, but not this seemingly Grammy-worthy composition that everyone was talking about. The weak performance didn’t help it in my eyes. #36: Very nice! I enjoyed it for all the reasons you mentioned. Nothing else to really say but, nice song. #35: Oh my, this is SO Mariah Carey. Well, I never really was a fan of hers, so I guess my opinion on this song is somewhat evident. I like it, but I don’t LOVE it. She sings the hell out of it, though. #34: Brilliant! Love this song! I haven’t ranked 2010 yet (there’s a summer/winter activity), but this will certainly be in the top 10. I just want to dance when I hear it! #33: This is pretty nice, although I’m not crazy about it. However, it does establish an on-off string of weird Armenian props with that toilet papered tree in the background. I prefer Joksimović’s stuff more, though. #32: Just copy and paste what I said about “Die for You,” although I like this one more. #31: Very sweet, very soft and very nice. I really like this song and its message. Can we swap hemispheres? I’d seriously prefer a winter to this hot, humid summer I get. Ironically, I caught a handball match between France and Norway (Norway all the way!) in which Norway lost, à la Tooji (sadly). Anyway, thanks for the posts! I agree, I don’t think “Horehronie” deserved a Grammy (especially not for Best Vocal Performance…) but I still love it. I have to wonder if Urban Trad themselves even knew what they were singing about! I’d take Edyta over Mariah any day, to listen to. Edyta doesn’t seem to feel the need to screech at the top of her lungs those super-high notes that Mariah somehow stuffs into every song. Balkan Balkan Balkan, ovo je Balkaaaan…come on!!! Three minutes of musical brilliance. And bowl haircuts. I’m sorry, but I am enjoying winter too much to sacrifice it for your summer. I hate heat, which often makes me think I was born in the wrong country. Poor Norway =”'[ They just can’t catch a break! I understand. What’s winter like in Australia? I know that here, winters can either be really dry and warm, or there can be a crippling blizzard that closes school for five days (I like those winters ;^)). However, I wouldn’t give up a winter for anything else. It seems that the perfect place for me would be somewhere like Iceland, where it’s never really hot (or warm for that matter) but not Siberian cold. And no, no they can’t, even though they deserve much more for how amazing they are. Well, there’s no blizzards here (though there is snow in other parts of the country to where I live). Winter is mostly wet and windy, and the nights can get freezing. I never complain though. I love everything about it…except for driving in the rain. I guess the equivalent of the perfect place for me to live would be Tasmania. I don’t know if you’re familiar with it, but it’s an island state at the bottom of Australia, and it very rarely gets hot there. It’s either wintery or springy. I.e. PERFECT. Apparently this blog is all about haircuts and weather these days!! I don’t know how that happened. It’s my fault! I’m so sorry! Just kidding. Enjoy your slushy winter! Tasmania sounds like either Seattle or Portland up in the Pacific Northwest (my dream cities), so it does sound absolutely perfect. And, considering that it’s on the other side of the world, I should make my way down there, ASAP. Although I can’t picture snow in Australia, one could be forgiven for not being able to picture a blizzard in Southwestern desert highlands where I live. The year-round climate is sort of like Kazakhstan’s, except it’s about 20 degrees Fahrenheit (11 degrees Celsius) warmer. I can’t picture snow in Australia either, to be honest. But it does happen! There are ski resorts and everything! Just a gajillion miles east of where I live. I’ve never seen snow. Is it overrrated?? I don’t think I’m the proper person for an answer to this question because the most of the snow I’ve seen doesn’t stay as snow for a long time and just becomes annoying ice. However, the one time there was a thick blanket of snow, it was wonderful! I just don’t know how one would feel if they got that kind of snow every year, like so many people do. But, since I can’t render a verdict on that, I say no, snow is certainly not overrated. I’ve seen worse, so it doesn’t bother me too much! Did you watch the olympics ceremony? (: I think it was really great. & I am a fan of big events =D so I just had to watch it. yeeah. I’ve also watched all the teams walking into the stadium only because I was waiting for Serbia and from ‘A’ to ‘S’ there are so many countrys. So, so, so, many. but okay =D I’ve seen Novak Djokovic with our flag =o woohoo. partytime.. or teatime? =) Dino & Milan are great. This man have voices you just have to remember. Okay in ‘Ovo je Balkan’ you maybe can’t really hear it =D but in some of Milans ballads you can. for example ‘Perje’. puhpuhpuh.. Not a fan of Nicole :’D sorry. I watched most of the opening ceremony, and it was worth it! I didn’t like it as much as Beijing’s, but it was awesome. I made to about “L” in the alphabet when the athletes were coming out before I had to go to bed (that was about 6.30am) so I missed Serbia. Now I know Novak (<3) was the flag-bearer I am regretting it…ahaha! I had a huge crush on Milan back in the day. Not any more!! Still loving his music though. "Perje" and "Solo" are my favourites. He's such a good live performer. Don't apologise for your English. A) It's not bad, and B) I can only speak one language, so I admire anybody who can speak more!! I should be able to speak 5.
my french is not that good. & Latin…yeah. never really tried to speak it. just had to read it and translate. =/ bah. I could say I am able to understand and speak croatian too. but it’s like serbian soo I’m not counting this one. I’m pretty sure I don’t have any Serbian in me. I just happen to love Zeljko and Novak muchly. And Novak has been on the Eurovision stage, which makes him even more awesome. With Milan I just meant I used to think he was good-looking! Even with that haircut. I still like his music, but I don’t like him in that way any more! You sound like a language genius to me!! It’s impressive that you can speak all of those, fluently or not. I’m trying to teach myself Croatian, and I’d love to learn Swedish. Maybe in time for Malmö?? Thanks! Or should I say, hvala?? #40: yay! I love Dino Merlin and this one was my favorite last year as well and it would be in my top 50 if I had one. The songs is so awesome that even my father asked me to put it on his iPod…and he’s not into eurovision nor into foreign language songs. #39: yay! I still can’t believe this din’t win the whole thing back in 2001. #32: yaaaaay xD this one is amazing and one of my faves that year. Probably the only year belarus has been in my top 10 in ESC. #31: I had a German teacher who loathed this song because she thought it was too cheesy xD I honestly don’t mind it, but I certainly don’t like is a s much as you do. So is Dino Merlin the only Eurovision-related song on your dad’s iPod?? I can tell you that’s one more than on either of my parents’. I do try to force Eurovision on them every now and then but it doesn’t work. They just humour my obsession. Anyway, your dad has good taste, we can say that much. Whenever I listen to Perje I always think how Zeljko-like it is. AKA amazing/haunting/other flattering adjectives. Mmm, Hayko’s toilet paper tree wasn’t the best prop in the world. But can we agree it’s better than a tacky six-foot boxing glove?? PLEASE say yes.